Diamonds are a woman’s best friend, but are they an investor’s best friend as well? The variables to this question are immense and getting one of them wrong means probably a loss for the investor. At first, diamonds might look like a simple buy and hold investment, less complex than buying PG (Procter and Gamble) there is no balance sheet, ROI or debt to cash ratio to analyse. Valuing diamonds is not only about the 4Cs: Carat, Color, Clarity, Cut and Fluorescence. Predicting the supply and demand dynamics of diamonds 5 to 10 years down the line is the diamonds is also an investors task. In this article, I make no predictions about the diamond prices, however, I provide you with arguments on the pros and cons of investing in diamonds. Good seeds to see if this particular tree can grow in your investment garden. Diamonds are a unique product of mother nature, refined by artisans to create artefacts of desire. They are truly beautiful. Diamonds add beauty and power to those who wear them. Some parts of society use diamonds as a means of self-worth or to telegraph wealth. This is one of the reasons, diamonds are in demand a status symbol. Diamonds are more practical to show off wealth than other forms of luxury items. Diamonds seeped into our cultural fabric and became synonymous with major life events: engagements, marriages, anniversaries through marketing by DeBeers, the primary suppliers of diamonds. There is nothing wrong with some clever marketing and a firm engineering the long term position of their product is pure genius. What is important for investors to foresee is the sustainability of these trends in the the next decades. Diamonds have the potential to be a hedge against inflation, market crashes and currency crashes. In times of economic crisis, real assets prices tend to climb as investors lose faith in the global financial system. Similar to gold, diamonds could be a form of insurance. Diamonds do not offer a yield and in such cases this is to their advantage. Other assets which do offer a yield will be priced down as that yield is less guaranteed in times of crisis. An interesting take on a structural crisis is the ICE-9 scenario. Diamonds could be of some help in such events. Diamonds are recognised valuable anywhere in the world this makes them a store of value recognised on a global level. Diamonds, together with gold and bitcoin represent the few forms of internationally accepted alternative currencies. Diamond prices are to some extent less exposed to the cyclical tantrums of the stock market. No maintenance costs, this is a great advantage when compared to investment watches. Grading systems from reputable firms such as GIA and Rappaport, make quantifying the grade of a diamond today easier than in the past. Finding the right investment diamond is like looking for the right diamond in a haystack full of diamonds. Specific diamonds which tend to keep their value tend to have properties of clarity in F or IF and have rarer colours such as pink, blue and red and priced in millions. There are various ways to invest in diamonds; physical diamonds, diamond miners and diamond investment funds. However, diamonds have not been on the front pages in this regard. In addition, people attach too many emotions to diamonds. Because of these two issues, governments could face some hurdles to start projecting diamonds in the same fashion as it does to cryptos and gold. What this means, is that diamonds could become one of the least regulated assets, which is easily valued, recognisable and transportable. Investors trying to create an insurance policy against sovereign credit crisis, systemic defaults could find diamonds as the last safe place to park one’s own hard earned money. In a nutshell, diamond could be a prized insurance against your life saving being cyprified* or turned into worthless paper as has happened in Zimbabwe and is today (April 2017) happening in Venezuela. *Cyprified: Loosing money in a similar fashion as to those unfortunate Cypriots. Approximately 20% of extracted diamonds are used in jewelry and 80% for industrial uses (such as laser, piercing parts and surgical equipment) There is strong demand for industrial uses, so it is a market that is not fully developed and can be exploited. Diamond sales have skyrocketed by demand in China, Asia in general, India and the Gulf. Also the banning of gold in India could be an opportunity for the attention to shift to diamonds. Currently, most diamond mines are discovered and, as time passes, diamonds will become more and more exceptional pieces, just like any other natural resource. If the investor is interested in making long-term investments, in the future the value of diamonds could multiply, so he could buy right now and save them for a while. Diamonds do not generate a yield. 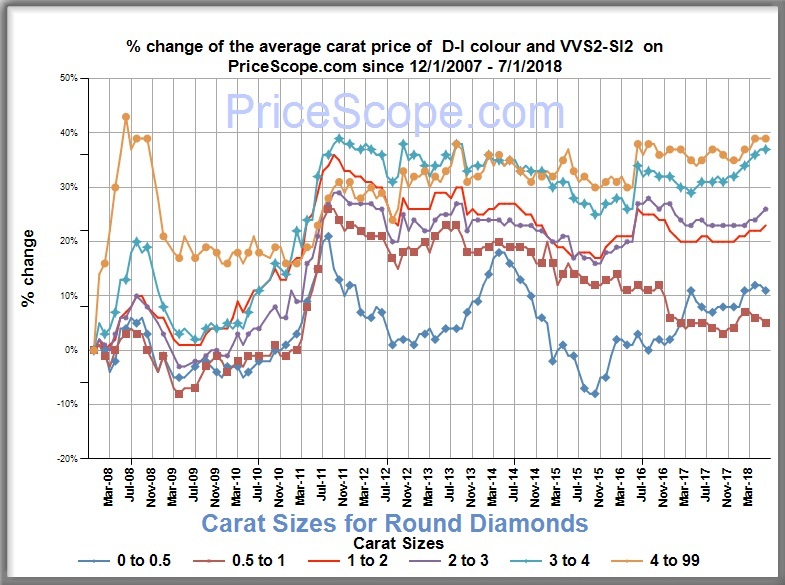 There is a wholesale diamond price and a retail diamond price. Retail investors buying at the retail price make an instant loss. The wholesale price of the diamond needs to increase more than the retail price, for an investment to earn a profit. Quick sale of diamonds, will generally lead to a loss of capital. Selling a diamond through an auction house means that fees and charges will apply, these will reduce the profit of the investor, on the other hand, they could also increase the ultimate selling price. Auction houses have the power to dramatise a sale and attract the right people to bid on the diamonds. Exceptional diamonds get an exceptional price, these are the true investment diamonds. Theses diamonds are worth north of several million because they are ultra rare. This scarcity creates additional value and prestige attached to these diamonds. Investor Learning curve. Learning about the diamond market, diamond investing pitfalls, finding the right dealers and creating a strong exit plan for the investment can be done only with some level of experience in the diamond market. New hasty investors could make mistakes. Diamonds sold without certificates carry additional risk in terms of accurate rankings and verifying the source of the diamonds. Appearances can deceive, cut and proportion may not be correctly judged. An investor without the proper knowledge might not be investing into what he or she thinks they are actually investing in. The growth of the industry is slowed by the absence of a centralised and transparent diamond market, which favours an inefficient formation of prices. The diamond industry has had problems throughout its history that has affected them, including scandals, etc., which has prevented it from developing as it should, so the investor should take this into account in the event that the Market does not change or evolve. They can attract the attention of the wrong kin and stolen. Carrying high-value diamonds attracts all kinds of attention, some of it the wrong kind. Man made diamonds (MMD) are also getting into the market, meaning not all diamonds on the market are products of mother nature. See more: Synthetic Diamonds. Millennials do not have the same attachment for diamonds as previous generations. Millennials value experiences more than diamonds, this could put pressures on future diamond demand. The supply of diamonds has been opaque for decades, it has been difficult to foresee exactly how many diamonds are coming to the market. This is an in-depth article on the dynamics of the supply and demand of the diamond market. Diamonds are a faith-based asset, as their value is not priced on utility. If diamonds are no longer seen as a requirement to celebrate sentimental occasions, their demand and prices are reduced. In recessions and depressions, people tend to focus only on the essentials reduce purchases which are not truly essential. New markets in precious and semi-precious stones such as Emeralds are being created and marketed, these are in direct competition with the diamond market. The erosion of the middle-class’s purchasing power in the west could be a threat to diamond supply. The 1% can only purchase so many diamonds. Conclusion: Are diamonds a worthwhile investment? Diamonds are a complicated investment, the danger is that initially, they might seem like a very straight forward one. Buy the diamond, hold it and then sell it. A company balance sheet can be “played with” to a certain extent and obfuscate the real value of a firm to a greenhorn investor. Diamond’s value is rooted in demand, supply and the unwritten contract from all the millions of people who own diamonds not to sell them. These interlinked trends need to be untangled by any investor who is willing to understand the full spectrum of risks before investing in diamonds. What is your experience with Diamonds? Have you ever made an investment, did it result in a profit or loss? Previous articleHoliday Crowd: Buy To Let Co-investing In The Short Term & Holiday Rental Market.